In order to play Minecraft, a player needs to know how to operate all of the basic character controls, use their inventory effectively, and build a crafting table and storage chest so to have a grid large enough to craft the items needed to survive in the game. Check out our video below which outlines the basics when it comes to using your inventory efficiently and operating the crafting grid to create items, an essential part of the game. Before you start gathering materials and crafting items, you should know how to manage the Inventory screen. The inventory is where gathered materials (from killing mobs or harvesting resources) are stored for use in crafting items. The nine squares at the bottom of the game screen display items you’ve obtained and consistently use such as weapons or building blocks. For example, if you break a block such as wood or dirt, an item pops out that is automatically picked up, causing it to appear in one of the inventory squares. The row of squares at the bottom of the game screen represents a quarter of the inventory, as you have a total of 36 available spaces. Character portrait: A small screen showing what your character looks like now. This portrait can change when your character sits or sleeps, wears armor, gets hit by arrows, drinks invisibility potions, catches fire, and more. Note: The above image represents a default character but you can also create your own Minecraft skin. The crafting grid in Minecraft is essential to game-play as it allows you to use materials to build objects & entities including weapons, armors, shelter, signs, resources, food, etc. When you first start playing, your character will only have four slots available, which limits the number of items that you can make. 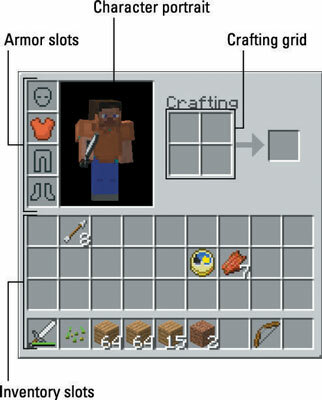 However, once you build a crafting table, you are able to use more slots and create additional items. In order to use the crafting grid, you simply need to open up your Inventory and place items into the various boxes (or slots). Placing different combinations of materials into the crafting grid will result in different item output. There is almost a limitless number of recipes available in Minecraft, so build and customize items to your liking!